While we make no bones about our disgust for organized dog fighting, dogs do enjoy gnawing on a meaty soup bone now and again. My dog Valentino with his first ham soup bone - a gift from our neighbor! 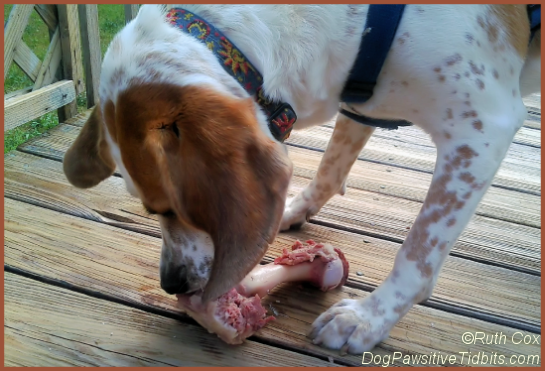 I gave my dog his gift of a bone on our deck ... Alone! That way, there could be no fights with other dogs and I could supervise him with this dog treat to prevent him from chewing the bone itself and possibly getting splinters that would be harmful. Funny thing ... Valentino chewed all the meat off and walked away, having little interest in chewing the bone! 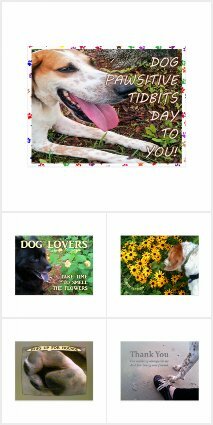 Having consulted my copy of Chase's Calendar of Events, I knew well in advance that today is National Dog Fighting Awareness Day. While this is a cause worth writing about year-round I chose to highlight it in my Wordless Wednesday post this week as a reminder to all who love pets and animals. 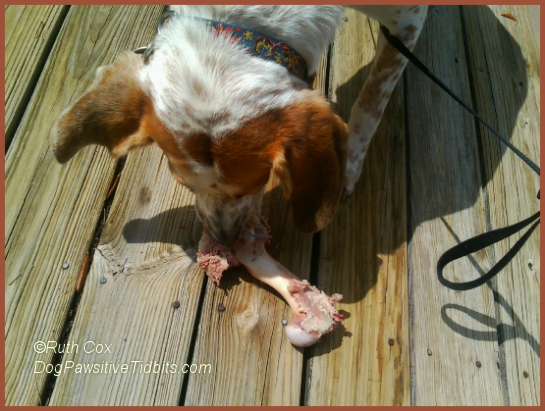 I am linking our bones tale up with Wordless Wednesday, hosted by the BlogPaws community.